Charleston based DP Dave Baker recently teamed up with the South Carolina Aquarium to help produce a Halloween special for the Weather Channel. The challenge? 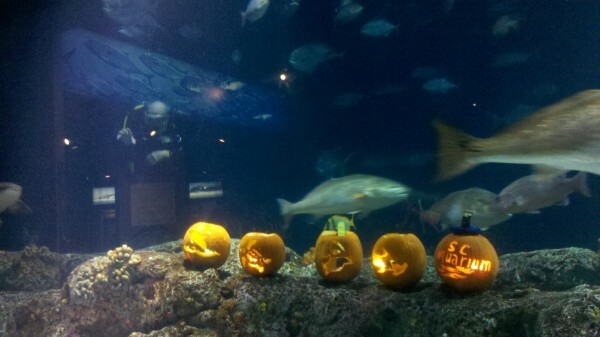 Underwater pumpkin carving in the aquariums 40 foot deep undersea exhibit. Divers submerged and went to work on their masterpieces amid hundreds of fish, sharks, and even a 300 lb sea turtle bent on eating the pumpkins. Dave shot from outside the tank on a Panasonic HDX900, Kino Flo Divas, and Bron Kobolds, while a GoPro captured the event from inside the tank. In the end, the pumpkins looked almost as good as the video! Happy halloween!